Last week I received some products from ELES™ Mineral Makeup for trial and this post is going to be a review on all the products I got. ELES™ Mineral Makeup is a sophisticated mineral makeup line specially formulated to enhance the results obtained from professional skincare. ELES™ Mineral Makeup allows skin to 'breathe' freely while shielding against age aggressors. Every product is free of heavy fillers and pore-clogging ingredients. The skin-safe formulas contain no potential irritants, such as fragrance, oil, talk and dyes. Every formula is hypoallergenic and oil-free. This anti-aging concealer helps to gradually improve the skin's texture while neutralising dark circles with its adaptable peach tone. The medium coverage formula provides continuous hydration and a natural longwearing finish. Contains Caffeine, Ascorbyl Glucisude- a natural form of Vitamin C, Marine Collagen, Vitamin E and Dermal Filler. It comes in 3 shades- Light peach, Medium peach and Medium and I got the shade Medium. It is a very thick concealer that glides smoothly under the eyes and provides medium coverage. I used it once without setting it with powder and the other day with powder and found that without powder it creased a little bit after 6 hours of wear. With the powder it lasted me 8 hours without creasing. I found the best way to apply it was by using my fingers as it melted the product into the skin. The colour selection is the only thing that I am a little disappointed with but I don't blame them for it as these shades would suit majority of the girls in Australia. I would highly recommend this concealer even for dark spots as it did help cover mine perfectly. If you do have a light to light medium skin tone then definitely give this concealer a go. This innovative treatment cream is formulated with nourishing and anti-aging ingredients including Vitamin E, Squalene and Goji Berry extract. A multi-tasking sunscreen, moisturiser, primer and tinted foundation also includes Broad Spectrum SPF 30 to protect the skin from damaging UVA/UVB rays. Available in 3 shades- Light Medium and Deep suitable for all skin types, I received the shade Deep. The colour as such is a little dark for my skin tone but I still tested it out around the house doing extra chores to see how well it lasts. I have oily- combination skin and this formula did not make my skin look greasy at all. It gave a beautiful luminous glow to the skin. I am not very sure about the anti-aging benefits this gives in the long run as I can't wear it everyday till I am a little tan. But in saying that, just as a BB cream, this product evened out my skin tone, provided moisture and gave me a little bit of coverage. Without setting it with powder it lasted me about 5 hours after which I started seeing a little bit of shine on my T zone. With my Rimmel Stay Matte powder on top, this ELES BB Cream lasted more than 8 hours on me which is pretty good for a BB Cream. I wish there were more shades to choose from for this product too but if you are looking for a good, paraben free BB Cream then this is a really good one. Kiss goodbye to dry lips. High pigment levels deposit rich, opaque colour while clever micro-bubble spheres continually release conditoners to keep lips hydrated and soft, while helping to set lip colour. Skin-safe, hypoallergenic formula contains Vitamins A, E, C, Chamomile and Aloe for smooth kissable lips. Available in 13 shades ranging from Nudes to Reds, these lipsticks have stolen my heart. I have been wearing them non stop from the day I got them. I received 3 shades - Micro Mocha, Micro Blush and Micro Flamingo. They are all that I look for in a lipstick- moisturizing, pigmented, smooth and do not leave your lips feeling dry after wearing off. Since they are quite expensive I expected a lot from packaging to formula. I love how they have a grey titanium tube packaging which is sleek yet feels a little heavy and not cheap plasticky. The lipstick formula itself is smooth and very hydrating. It does have a pleasant sweet, fruity scent to it and I love that. You all know I am very finicky when it comes to lipstick scents as they do disturb me if they smell funky. They wear around 4 hours on me without any food or drinks and wear off evenly. The Micro Flamingo shade did stain my lips after 5 hours of wear. Micro Mocha is a muted rosy brown shade which I love for everyday wear. It is a creamy satin finish with no shimmer or frost. Micro Blush is a strawberry pink shade with a slight frost finish. I usually don't prefer frost finishes but this one is not over powering. It gives a nice shimmery sheen to the lips. Micro Flamingo is this bright barbie pink with blue undertones. On my skintone it leans towards a purply pink shade but I love it. I don't have any colour like this in my collection and it has a creamy matte finish. I have been loving all the products from the ELES™ Mineral Makeup range so far and highly recommend you to try them. 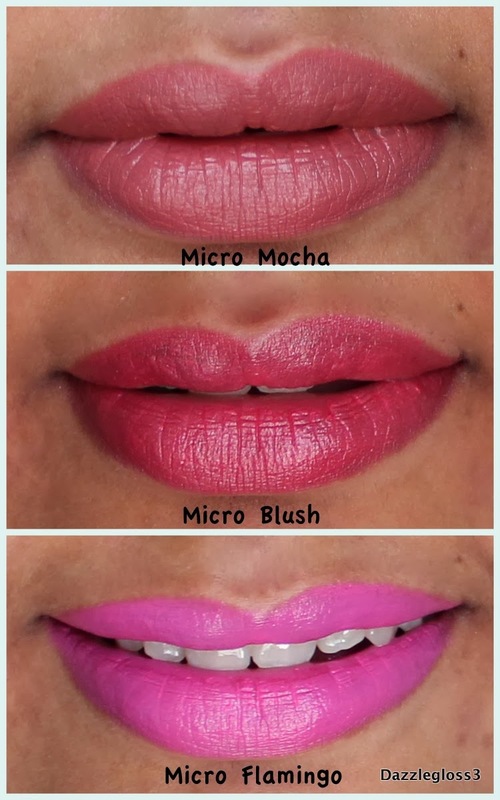 My absolute favorite would be the Micro Bubble Lipsticks. You can buy all of the above products from here. Have you tried any products from the ELES™ Makeup range? Which is your absolute favorite? *This item was kindly provided to me. As with all my posts, it is 100% honest and of my own personal opinion. For more information, visit my Disclosure Policy. Aren't ELES products amazing? They have grown to become one of my favourite brands. The lipstick formulation is just amazing! I did have high expectations after reading about them in your posts and I am glad they delivered that. The Micro Mocha looks gorgeous on you! I've seen quite a few reviews of their products but am still yet to try them myself. Thank you! And you should give them a go. Beautiful products. I really enjoy using ELES products and their lipsticks are definitely a standout, there's just something about the formula that works so well! They have easily become my favourite kind of lipsticks.